In Edmonton, I would add in Mayfield common. It used to be an indoor mall, but has been convertered (15-20 years ago) to big boxes. Meadowlark mall can also be added in - This mall will see redevelopment as and possible TOD when ever the LRT goes down 87ave. This mall kind of died after WEM took shape 12 blocks west. Westmount mall is just a drop in center for seniors these days, and will see part of the mall converted into a Home Depot. Millbourne mall in Millwoods almost died, and is saved by a local safeway, and a call center, which took over a zellers that was formerly in its place. The Decarie square has been converted into office space a long while ago. hard to compete with southgate, kingsway, and WEM WEM WEM in Edmonton. Here's a picture of City Centre in Hamilton, not a great picture, but you can see the deadness. Terrasses Rock Forest in Sherbrooke is almost totally dead... 4-5 stores are still open, but there are plans on the way to destroy the mall and replace it with a power center. sort of like how middlegate mall went from dead one level huge parking lot waste of space to highgate village! Hamilton City Centre has improved a lot over the years, got a new department store Hart's (Quebec company). The top two floors are all call centre jobs with more coming and this year City Hall is relocating into City Centre so it'll be packed by the fall. I remember reading an article saying City Centre is 98% filled. So I wouldn't say Hamilton City Centre is dead, in fact I say it died and went to heaven. For all you Montrealers, does somebody recall what was the name of the empty shell which was supposed to become a shopping mall but was never occupied and was destroyed a few years ago in RDP or somewhere around there? I have no idea of the name, but I know exactly what you mean. It was abandoned for almsot 10 years until the structure was torn down, and was replced with a Canadian Tire, a Loblaws, a Bank of Montreal, a Tim Hortons and an SAQ. Centre Mall in Hamilton. Not quite dead, but very incredibly dated and dead "looking". There has been talk of a massive reconstruction project in the last 2 years, but nothing is really moving forward. When I lived in Toronto last, we lived near "Lawrence Square" which is at Allen and Lawrence West. 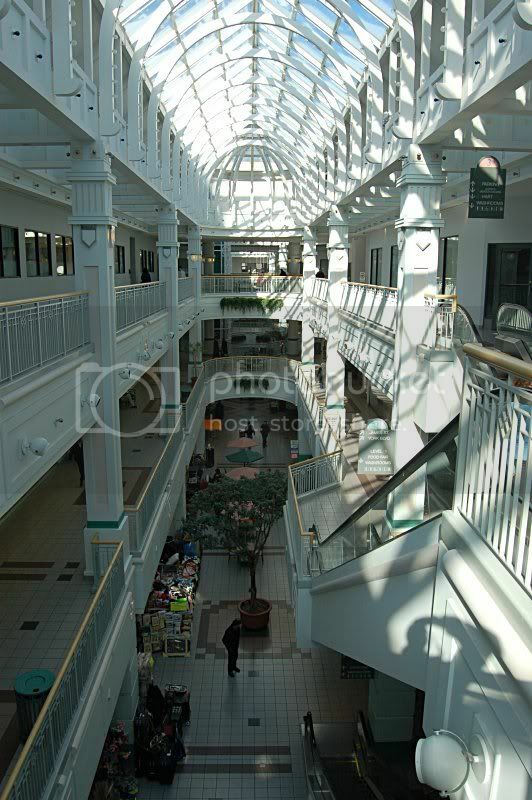 To call it a mall is actually kind of a lie... it was more of a glorified strip mall with a Zellers and a Canadian Tire. The food court was the most depressing thing I had ever seen. Thanks, where was it exactly? Couldnt agree more about INternational VIllage, such a pathetic mall. I keep thinking the stores will begin to fill in wiht all the condos being completed in the area but it just stays empty... the theater on the other hand is amazing, always cheap prices and reclining chairs, amazing! what ?? maybe I'm mistaken it for some other shopping mall, the one I was posting about is on the service road of Decarie highway. All white metal and glass! Last edited by BSLetters; May 1, 2007 at 7:28 AM. Even though this 'dead mall' is from Hamilton it looks eerily similar in style to Eaton's Centre in downtown Edmonton ... Eaton's Centre used to be quite vibrant and upscale ... well that was until Eaton's went belly up about 10 years ago ... since then the mall has done steadily downhill with fewer and fewer tenants ... mind you I haven't been there for a few years ... do any of you Edmonton forumers know if Eaton's Centre is still a disaster or has it revitalized itself? It is pretty lame but its not as bad as it used to be. Have you been there lately? It's filling up with a shitload of interesting art stores. In one of the stores any local artist can contribute their art, and if sold the owner will give a percantage of the sale to the artist. There is also this really cool Asian store with paintings, huge jade carvings and even these massive wooden doors that look like they would lead to an emperors house.